Mehdi Hasan, Laurie Penny and Ken Livingstone on the riots | Internet special: the web at 20. 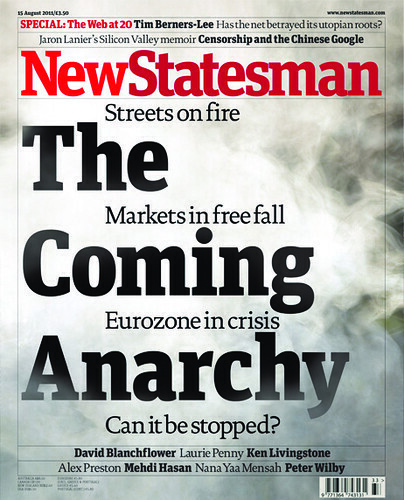 In this week's New Statesman, we report on the current domestic, European and global crises. Alex Preston describes the panic among city analysts and asks how much worse the international markets can get. Meanwhile, David Blanchflower explains how western government policies have pushed us back to the economic precipice. UK riots coverage includes a guest column by former London mayor Ken Livingstone, who calls for more investment in the capital's police force.Mehdi Hasan questions the skewed judgement of the Prime Minister, and Laurie Penny considers the language of social division. For this week's 20th anniversary of the World Wide Web, we profile its British creator, Tim Berners-Lee, and his concerns for commercial net neutrality. Also in this internet special, computer scientist and virtual reality pioneer, Jaron Lanier, recalls the early days of Silicon Valley counterculture, and Jonathan Margolis investigates censorship on Baidu, the "Chinese Google" with 400m users. All this, plus an interview with the controversial visual artist brothers, Jake and Dinos Chapman, Keith Hopper on the greatness of Flann O'Brien, and Edward Thomas's poetic visions of England.